This was one of those composing-the-blog-post-in-my-head-as-I-bake recipes. I started pulling the ingredients from my pantry and thought about all those poor people out there who are afraid to make bread because they are afraid of yeast or dough or yeasted dough. I’ve done yeast pep talks before, both here on the blog and in my cooking classes, and I figured it was time for another one. The dough was incredibly quick to mix together and had a short rise time. But! The dough did not double, as the recipe said it would after an hour, nor did it even rise a little. I know from bread baking experience that I could just persevere and all would be fine. But! The dough was really sticky. Like so sticky that I probably used about a cup of flour to just make sure it didn’t stick to the rolling pin and the board. But! The dough was also so fragile that I tore it a couple of times trying to roll it so I gave up and floured my hands really well and started pressing it into the desired rectangle. Except that my rectangle ended up looking more like the state of Nevada than a rectangle and that is when I reminded myself that this – THIS – is why people are afraid of yeast or dough or yeasted dough. 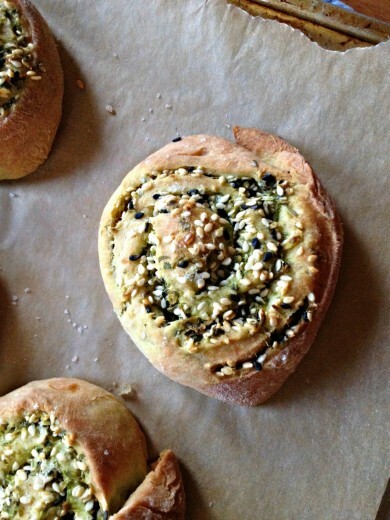 As soon as the scent of baking bread mingled with the filling of puréed scallions and cilantro mixed with a liberal amount of sesame seeds began wafting out of my oven, I had moved beyond my frustration. I cleaned the flour off the counter and out of my hair, and was ready to give these rolls another chance. Randy, having seen none of the drama, proclaimed these “oh wow, super yum” which is as close to an A+ as I can get. And truly, for how impressive they look and for how tasty they are, the stress is more than worth it. The texture of the dough is slightly flaky and they are just the slightest bit sweet, but also nice and herbal and savory and a bit nutty from the sesame seeds. I sprinkled a good French sea salt over the top of them before going into the oven and I would suggest you do the same. The recipe ends with the dreaded words “best served warm”. I did happen to time their exit from the oven with dinnertime. We ate four of them, I allowed the other eight to cool and then wrapped them in foil and stuck them in the freezer. Several nights later I pulled a few out and heated them in a 325º oven for about 10 minutes and they tasted as good as the day I made them. If you don’t have black sesame seeds, just add another tablespoon of white to the mix. Line a baking sheet with parchment paper. Pour ½ cup warm water (105º – 115º) into a small bowl. Sprinkle yeast, 1 tsp. salt, and 1 tsp. sugar over; let stand until mixture bubbles, about 10 minutes. Place flour, butter, remaining 1 tsp. salt, and remaining 1 tsp. sugar in bowl of a stand mixer with dough hook attached. Rub in butter with fingertips until mixture resembles coarse meal. Beat in egg, yolk, and yeast mixture, scraping down sides. Knead on medium speed until dough is soft and smooth, about 5 minutes. Form dough into a ball; transfer to a large, lightly oiled bowl. Cover and let rise until doubled in size, about 1 hour. Meanwhile, combine scallions and cilantro in a food processor and pulse to finely chop. (DT: I used my mini food processor for this one.) Transfer mixture to a medium bowl; stir in all sesame seeds and 3 tbsp. olive oil and set aside. Preheat oven to 350º. Roll dough into a 18×9″ rectangle. Spoon scallion mixture evenly onto center and spread mixture to corners of dough. Working from one short edge, roll dough rectangle into a cylinder. 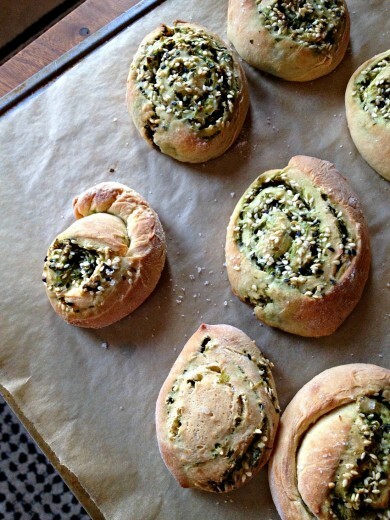 Cut cylinder into ¾” dough swirls. Transfer dough swirls to prepared baking sheet; brush each with oil and sprinkle with sea salt. Bake until golden brown, about 30 minutes. Oh man, this look so good. I am going to make them this weekend for a BBQ we are going to. in my almost four years now of bread baking I’ve learned some tricks to pretty much ensure that all goes smoothly (or at least that my yeast is alive and kicking) but I can totally get why people are intimidated! Once you’ve done it enough times, you get a feel for it. But it takes a while. I KNEW this was the bread from Bon Appetit! It must be a sign that I should make it. ASAP.